Article from Reason by Zuri Davis. 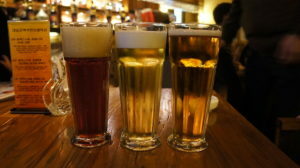 The Division of Alcohol and Beverage Control (ABC), which answers to the Department of Law and Public Safety, passed a special rulingin September that imposed new terms on licensed microbreweries. The enhanced regulations say the business cannot hold more than 25 special events each year. That includes trivia nights, televised sporting events, and classes for art and exercise. Breweries will receive just 12 special permits a year to sell their products offsite at beer festivals, music festivals, civic events, and the like. They’ll also be limited to hosting 52 private parties per year—and they must notify the ABC 10 days before each event. Does this have the fingerprints of the major breweries? Think about that for a moment and then think about who owns the major breweries. They aren’t Americans. Good grief, don’t these germs have anything useful to do? I thought they were supposed to solve important problems — not regulate the length of our toenails. New Jersey,or East California, will do anything to hamstring small businesses. Be there in November. VOTE or the same thing will happen in your state!